Managers Simon and Ruth, guides Ryan, Nevers Alex, Henry and Colins, plus the team that makes sure everything runs smoothly ‘behind the scenes’: a team of champions, as the camp likes to call their employees. Together they are the driving force behind this well-oiled ship called Sausage Tree Camp. The famous Sausage Tree Camp is a chic safari camp in the heart of Zambia’s Lower Zambezi National Park. 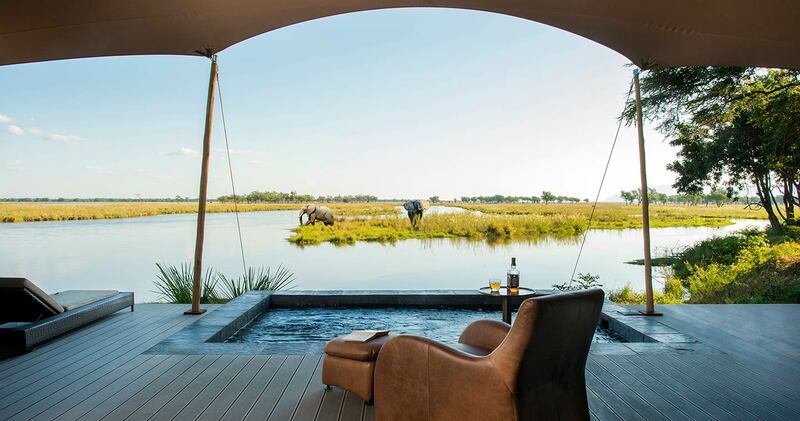 Situated on the banks of the Zambezi River, this tented camp overlooks an expanse of narrow channels and low set, reed islands with the magnificent Zambezi escarpment as a backdrop. 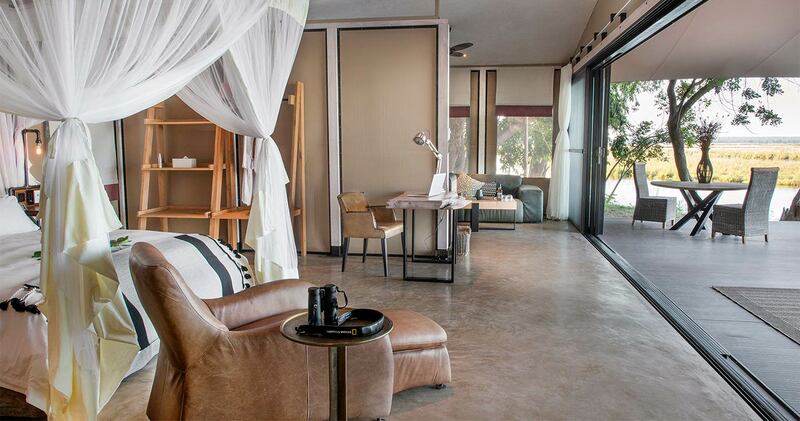 This luxurious camp, where a private butler is waiting to serve you, does it without losing its ‘bushcamp vibe’. It is the professional staff that makes this happen: no detail in pampering you is overlooked, but they also are walking encyclopedias when it comes to knowledge about the area. As your butler keeps surprising you with big (and small) treats, so will your guide keep revealing bush secrets around every corner. 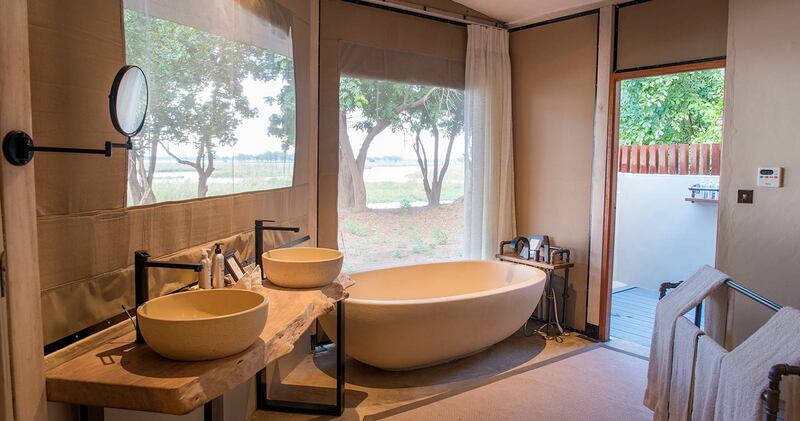 This is pampering in the broadest sense of the word: hot baths and candlelit dinner combined with incredible wildlife sightings and interesting bush-factoids (and plenty of humor, too). 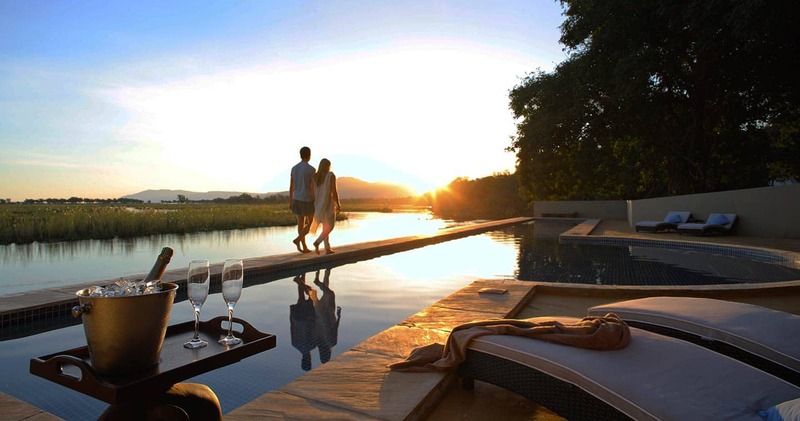 The epitome of bush chic, Sausage Tree Camp offers a civilized, luxury approach to a bush experience. 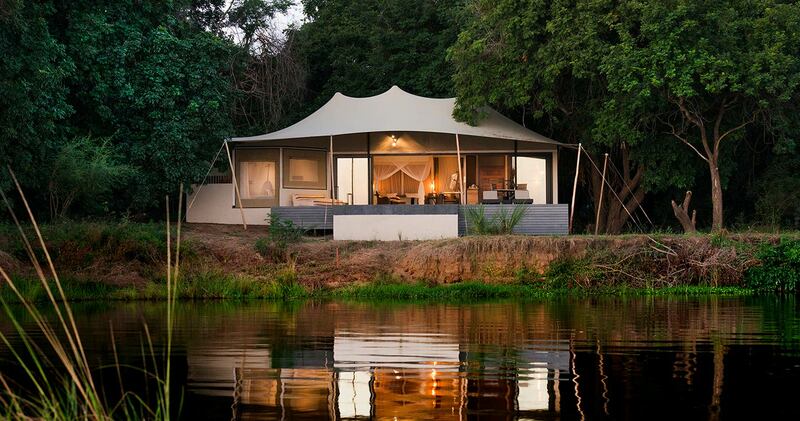 The camp has eight slightly raised, generously spaced, reed, wood and white canvas safari tents. 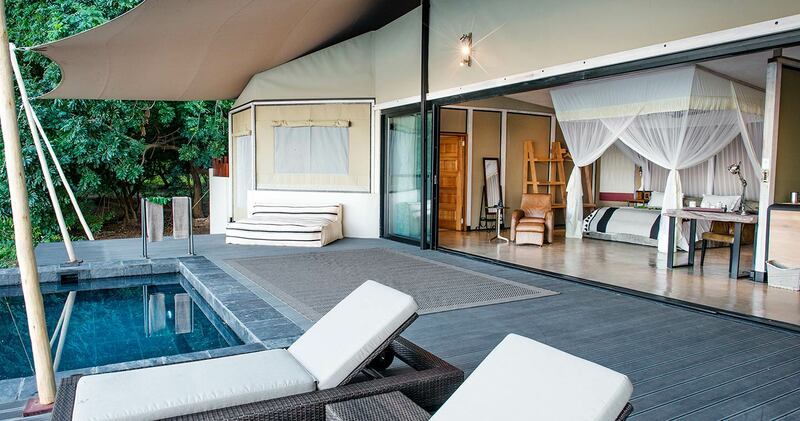 The seven luxury suites include a king size bed, semi open air bathrooms, a dining area, private pool and expansive deck. What else did you expect at a high-end lodge like this? And then there is Kigelia House: a two-bedroom house, perfect for your family or a small group of friends. Every tent has a dedicated and personal butler, plus electricity around the clock. There is a central dining and bar area fronted by an enormous teak deck overlooking the Zambezi, and a generous shaded swimming pool. Together with plenty of plush comfortable chairs, this is the place to unwind. What does a day at Sausage Tree camp look like? A soft knock and the smell of fresh coffee will wake you around 5.30 in the morning; time to rise and overlook the Zambezi River, while breakfast warms over a crackling fire. 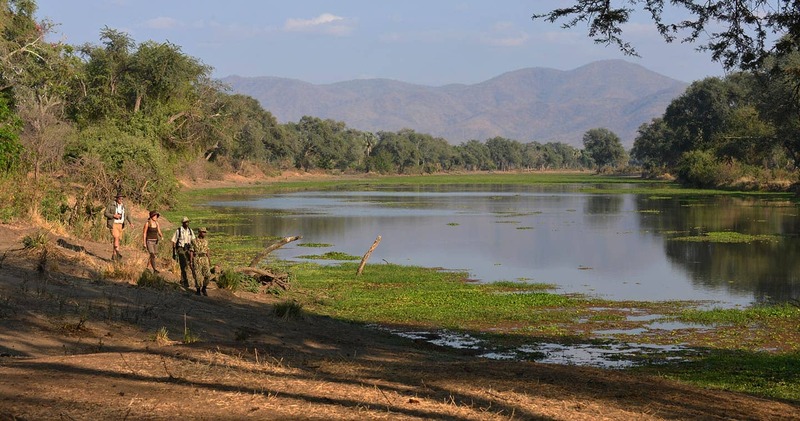 The first activity of the day can be a canoe trip meandering by the riverbanks, a game drive to catch sights of lions and leopard, or a walk to take in smaller – and often missed – details of the bush. When returning to camp, lunch will be waiting for you, consisting of homemade bread, fresh produce, salads, pastries and cheese. This might be enjoyed on a sandbank of the river with cooling water lapping at your feet. After that, do like the lion that just feasted on a buffalo: take a siesta (paws aloft) and rest up for dinner. Before you know it, it will be time for a yummy high tea and the afternoon activity: ready for some Tiger fishing? Or hop in a vehicle and be amazed by the myriad of nocturnal species as they emerge from their hiding places. To top it off, dinner is served in either the communal area under the stars, in the privacy of your own room or an even ‘wilder’ location (spoiler alert!). Nothing seems off-limits at Sausage Tree Camp. Beautiful setting on the mighty Zambezi River. Spacious tastefully decorated tents and a nice bathroom under the sky. Outstanding, friendly service, delicious food, fantastic game drives and boat trips with our experienced guide Alex; wildlife abound! One of the best places I have been in Africa! It felt like coming home. This lodge has top quality service, staff, guides and location. Really enjoyed my time there, definitively a great place to stay in Lower Zambezi. They organised a Bush dinner and island lunch for my father's birthday, their attention to detail is great. We had wonderful guides throughout our stay in Zambia, so it is a special distinction that our guide at Sausage Tree Camp was far and away the best safari guide we encountered in Zambia or Botswana. Nevers Mulinganiza is an extraordinary naturalist with sharp eyes and broad knowledge of the land, it's history, and the life that is teeming in the Lower Zambezi. We learned so much from him in the four nights we spent at the Camp. He particularly shaped my 15-year-old daughter's view of nature and wildlife in a way that leaves me forever grateful. No detail was too small for him to notice, and our drives and walks with him were the highlight of our time in Zambia that was amazing in it's own right. Never was often accompanied by Clesher, an exceptionally gifted tracker who could spot the most carefully camouflaged animal. I trusted both of them to canoe with my daughter down the Zambezi, navigating territorial hippos. We had a fantastic time at Sausage Tree. We camp's location on the Lower Zambezi River offers unique safari experiences such as fishing, canoeing, and boat cruises. We didn't see as much variety of wildlife as we have on other safaris in South Africa and Botswana, but the quantity of hippos and elephants was incredible. We loved hearing the hippos "talking" at night right outside of our room. The staff at the camp made the experience even better. They were helpful, incredibly knowledgeable and, most of all, a lot of fun! I highly recommend Sausage Tree and would love to go back one day. Sausage Tree Camp was voted number one on the BBC Holiday Programme's 'Ten Best Luxury Destinations'. Please note: A single supplement is not applicable. Read all about travelling to Sausage Tree Camp on our getting to Lower Zambezi page. Sausage Tree Camp is best accessed through Kenneth Kaunda International Airport (LUN) near Lusaka followed by a short light aircraft transfer to the Jeki Airstrip. Children of 8 years and older welcome. We hope you have found all information needed to decide that Sausage Tree Camp in Lower Zambezi National Park is the perfect place for your next travel adventure. Please fill in the contact form and we will get back to you soon!